If you shrugged off sleep, kept your track-pad finger hovering over order options at the online Apple Store, or camped out/paid someone to stand in front of a physical store overnight, you're helping the new iPhones get off to a rousing start. "Demand for the new iPhones has been incredible, and we are currently sold out or have limited supply of certain iPhone 5S models in some stores," an Apple representative told AllThingsD. But you really have to look no further than the long lines and extended shipping dates to know that. The gold iPhone 5S looks of particular interest to consumers, and Apple is reportedly preparing to give them more of what they want. According to the Wall Street Journal, Apple has tugged on suppliers' ears to up production of the new gold iPhone. Apple apparently wants production to jump up another third based on the strong demand it's seeing for the champagne-colored handset. 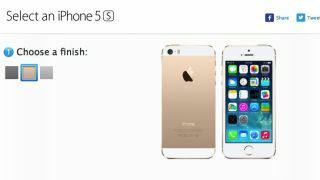 AllThingsD noted in a separate report that Apple's manufacturing partners have been asked to "significantly" increase gold iPhone 5S production. The Journal's report focused on Hong Kong demand, but in the U.S., the gold iPhone's ship time has been pushed to October on all four carriers and in all storage configurations. The white and space gray models, meanwhile, are able to ship within seven to 10 business days from any carrier in 16GB, 32GB and 64GB options. Supplies of the iPhone 5C, meanwhile, appears to be holding steady, and will get to U.S. customers in one to three business days. Read our review of the iPhone 5S and iPhone 5C to see if the phones are worth the wait.